Posted on Mon, Apr 25, 2011 : 6:33 p.m.
Ann Arbor-based book store chain Borders Group Inc. is investigating whether any of its customers' personal data was exposed on a website that apparently contained information about its loyalty program. 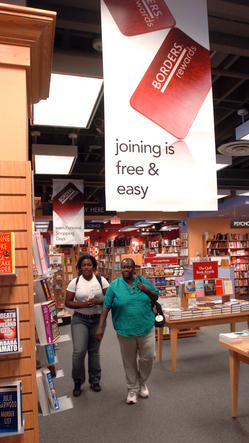 Borders Rewards, the company's customer loyalty program, has more than 41 million members. The website, which has since gone offline, published a searchable database containing information associated with the Borders Rewards loyalty program, according to a blog post Saturday on a blog run by Borders workers and former employees. It was not immediately clear how long the website was live, how the information may have become public, or whether any information was inappropriately distributed. Borders Rewards has more than 41 million members. The company uses it to email coupons to customers and provides additional discounts to people who pay an annual fee of $20. Borders spokeswoman Mary Davis confirmed in an email that the website had been taken offline and is "no longer accessible externally." "We take the security of our members' information very seriously and are currently investigating the situation," she said. The website was apparently set up by a marketing firm called Brierley+Partners, which helped Borders design and implement Borders Rewards. A spokesperson for Brierley+Partners was not immediately available to comment. The situation comes as Borders is navigating Chapter 11 bankruptcy. The company is closing 226 superstores and considering a move out of Ann Arbor. The incident also comes as major corporations are increasingly struggling to dodge external ploys to gain access to customer data. Earlier this month, a company called Epsilon, which manages email marketing for major retailers like Best Buy and banks like JPMorgan Chase, announced that the names and email addresses of millions of customers may have been stolen. Borders was not on the list of companies affected by the Epsilon breach, however. The blog run by Borders workers and ex-employees published a post Saturday about the website that may have contained the Borders Rewards information. The original poster, claiming to be a former Borders employee who left the company "many months ago," claimed to have "pointed out this security flaw to my manager, district manger, customer support" and through an internal communication system to the company's president. Wed, Apr 27, 2011 : 12:49 a.m.
&quot;We take the security of our members' information very seriously...&quot; Oh yeah. Like another commenter here, I have been a Borders customer since the original ==&gt; yet, Borders has never been able to call up my &quot;rewards&quot; account info. I have gotten some deals - by simply using the emailed (printable) coupons Borders puts out. Funny about that: they know my email address but NOTHING else, they can't find my name, address or phone number. I guess that's what they call their 'security system' - and it works! LOL! So stealing Borders' customer database would only result in the crooks getting a monster headache over the frustration involved in trying to use it. Great crime fighting, Borders! ;-) I would stop buying from them altogether but it happens that their downtown store is just a good stroll from my place. So it is, when I find something I want &quot;now&quot; - I can often reserve the item online, then walk there to pick up my purchase. Tue, Apr 26, 2011 : 5:24 p.m.
Nicola's Books is where I shop. It's locally owned and run and has great customer service. Tue, Apr 26, 2011 : 1:16 p.m.
ECHO....Echo....echo.... ...you mean Borders is still in business? Tue, Apr 26, 2011 : 10:46 a.m. Borders Rewards program is a farce! I went to the closing of the Arborland store only to find out I am not in their computers and they could not find my info. So much for their Rewards program. I go to B&amp;N now! Tue, Apr 26, 2011 : 1:56 a.m.
Stuff like this is why I try to always pay cash and never sign up for special programs. Customer demographics and profiles are a valuable commodity. Tue, Apr 26, 2011 : 12:06 p.m.
What Borders knows about me can be found in the white pages. I'm not losing sleep over this.